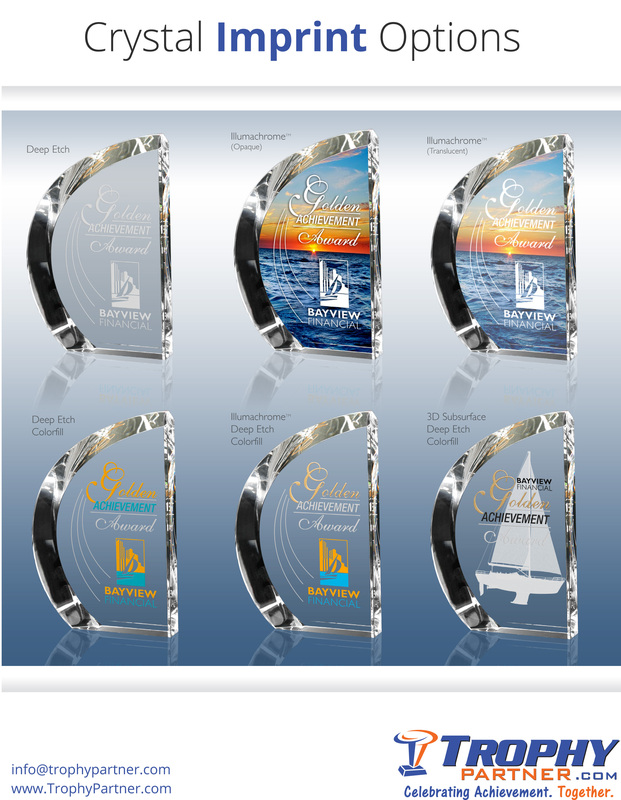 Custom Crystal Awards are a great way to recognize the top stars in your organization. TrophyPartner.com offers custom crystal trophies and awards for all occasions: sales achievement, years of service, retirement, rising star awards, rookie of the year trophies, crystal gifts, and high quality sports trophies. We offer more imprinting processes than anyone in the industry including: deep etch, colorfill, 3D subsurface, and IlIllumachrome to make your awards really stand out. 4) Award Occasion: sales achievement, retirement, service awards, etc. We will put together 2-3 concepts that are within your price range and email those to you. Chose from one of the designs or tweak it until we've put together the perfect award for you. Please check out some of our beautiful crystal awards from our video below and explore all of the different ways we have to imprint your award to make it a truly special piece for your recipient.